The 2016 Vosne-Romanee Vieilles Vignes contains a small percentage of whole-bunch fruit. It has a very seductive and very floral bouquet with black cherries, blueberry and crushed violet scents storming from the glass. The palate is medium-bodied with some new oak to be subsumed on the entry (there is 20% in the final blend), very well balanced and focused with an agreeable succulence that delivers the long finish. 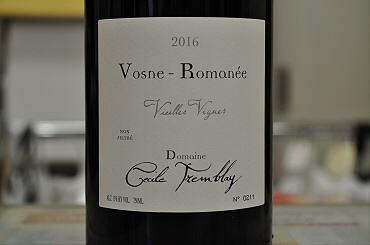 Maybe this does not quite possess the panache of the 2015 last year, but it is a lovely Vosne-Romanee that will deserve a couple of years in bottle. The 2015 Vosne-Romanee Vieilles Vignes is a blend of Aux Commune and Aux Jacheres lieux-dits, the later situated near to Nuits Saint Georges. It has a more floral nose than its peers with crushed violet infusing the dark cherry and mulberry fruit. The palate is medium-bodied with lithe tannins that are neatly offset by the tart cherry fruit on the entry. These merge into darker fruit, blackcurrants and boysenberry jam towards the structured finish, which is endowed with impressive depth considering it is a "mere" village cru. I would just like a little more finesse to complete the package and that should develop with bottle age.